A local authority is auctioning 152 pieces of artwork, despite criticism it will be “lost to the public forever”. 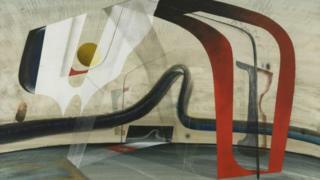 The sale, which begins at 11:00 GMT, includes works by 20th Century British artists John Tunnard, Edward Wadsworth and Barbara Hepworth. Opponents of the sale want the “significant body of art” put in a trust. The council said it wanted to get rid of 90% of the collection because it was at risk of deterioration and there was a lack of resources to manage the artwork properly. The sale includes works by prominent painters such as Joan Eardley, Anne Redpath and John Minton. Those which will remain include four Henry Moore and Barbara Hepworth sculptures, which alone are insured for £21.85m. ← Council tax increase: Why am I paying the police so much?